This UK première has been long-awaited: the first of Jake Heggie’s operas, originally shown in San Francisco in 2000 and since performed across the world – from Canada and Australia to Germany and Sweden – finally made it to Britain, with a stellar cast headed by Joyce DiDonato. It is to be hoped that it will be reprised, the Barbican’s semi-staged production having been scheduled for only one night. Terrence McNally’s libretto is based on the eponymous novel (turned into a film by Tim Robbins in 1995) by Sister Helen Prejean. An advocate of the abolition of capital punishment, she has served as a spiritual adviser to prisoners on death row. The opera tells the story of her encounter with convicted murderer Joseph De Rocher, and of the feelings that his crime and sentence to death provoke in all those affected: in the murdered victims’ families, in that of the condemned prisoner, in herself… Against the initial advice of a fellow-nun and of the prison chaplain, Helen sets out to be the human face of divine love for De Rocher, but her faith and humanity are severely tested by a series of strong emotions within herself: revulsion for his crime; the struggle to forgive a man who is remorseless almost until the end; the profound uncertainty, when faced with the boundless anguish of the victims’ families, about whether she is doing the right thing. In the pre-concert talk and in the programme notes, Heggie, director Leonard Foglia and Sr. Helen (who couldn’t attend but contributed via a video) explained that the piece is about everyone’s ‘journey to empathy’. As Foglia writes, ‘Sr. Helen’s journey is our journey.’ In the opera, her prayer is ‘Make me strong, make me wise, make me human’. The real-life Sr. Helen says people ‘just need a way to reflect more deeply, to be able to come to those good parts of their hearts. That’s what the arts do too: the arts bring us there as well.’ The opera brings the audience with her on an intense emotional journey. Dead Man Walking is a strong piece of musical drama in which one senses the melodic and harmonic legacy of Bernstein and Sondheim. Its power rests in the fact that its themes are timeless and the topics current, and the trajectories both individual and societal. Its success owes much to the close collaboration between McNally and Heggie. The libretto’s momentum reveals the playwright’s insight and experience, while the music – vocal and orchestral – shows the composer’s deep knowledge of singing voices. Together, they prioritise an immersive experience over poetic form: characters’ vocabulary reflects their individual circumstances. Foglia’s direction brings that focus on psychological truthfulness to the fore – this was a semi-staged production, but more complex sets weren’t missed. 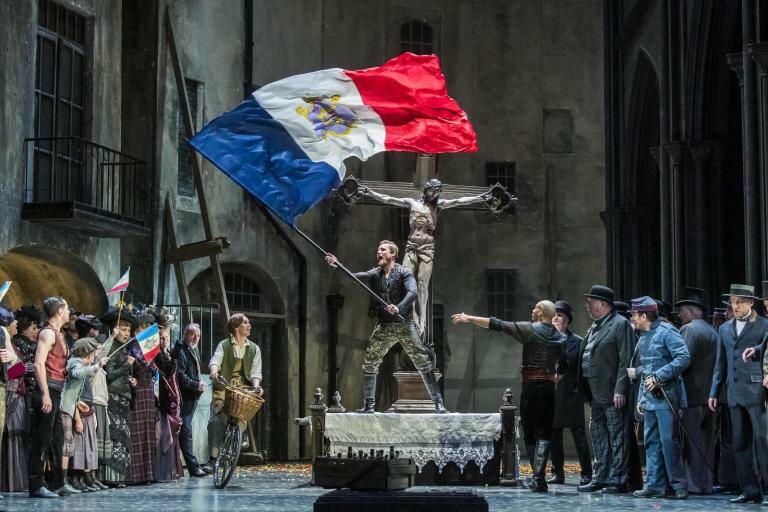 Purists may argue about exactly where the line between musical theatre and opera lies, but particularly the demands on the voice argue for placing this piece firmly in the operatic sphere. Though melodic and accessible, it incorporates traditional elements of opera – from ariosos to choruses – unified by motifs. It combines all these with the use of different musical styles, from blues (the action is set in Louisiana) to hymns (‘He will gather us around’ recurs as Helen’s leitmotif) to echoes of rock n’ roll (‘Jailhouse Rock’). Parts of the orchestral score could be lightened to allow for greater nuance, though. DiDonato has sung the part of Sr. Helen repeatedly before, and stars in one of two recordings (the other is with Susan Graham). At the Barbican, she performed the role with delicate insight, starting out as a well-meaning young nun who embarks with naiveté on a path far more arduous than she could have imagined, and who matures as a human being and in her vocation by courageously facing a terrible crisis. DiDonato’s voice was glorious throughout, and she was deeply in character – a sincere, moving performance. Michael Mayes performs widely in contemporary operas, including in three more by Heggie. He is the acclaimed interpreter of the role of De Rocher in several of the productions staged to-date. He was frighteningly convincing in the part: physically and vocally powerful; unsympathetic in his denial of closure, almost until the end, to the victims’ parents; eventually, revealing his terror of the end and his desire for forgiveness. In the superb cast at the Barbican, the mothers of the victims were sung by Susan Bullock and Susan Bickley, two of Britain’s best known sopranos and mezzo-sopranos, respectively, and the fathers, by Spanish baritone Toni Marsol and British tenor Mark LeBrocq. Together with DiDonato and Zifchak, they sang a sextet which constitutes one of the opera’s most poignant moments. ‘You don’t know what it’s like to bear a child, kiss his bruises,’ the parents sing, ‘…and pray to God he turns out right… and then one night… An empty chair at the table…’ They sing, distraught, of the last words they spoke to their children: ‘Shut the door’, ‘comb your hair’, ‘do your homework’… Assailed by the pain felt and expressed by all sides, Sr. Helen eventually faints. Her friend Sr. Rose was sung by Canadian soprano Measha Brueggergosman. Her rich tone is ideal for the role, which alternates practical sense with tender sensitivity and inner strength. Michael Bracegirdle gave us a deeply pessimistic prison chaplain, while James Cresswell brought out the surprising humanity of the prison warden. The BBC Singers conjured a menacing world of prisoners who jeer the passage of a nun through the jail and who mark De Rocher’s final steps with the chant ‘Dead man walking’. The Finchley Children’s Music Group brought on stage the contrasting light of children’s song. Mark Wigglesworth conducted the BBC Symphony Orchestra with the notable energy the piece demands. There were moments when the orchestral sound overpowered the voices – that would undoubtedly be adjusted, in a longer run of performances in the same space. The artistic direction of the Barbican deserves praise for having brought this production, part of its ‘The Art of Change’ season (for more about this click here), to the UK. Equally, the piece now deserves to be seen by more than the lucky few who could attend this performance. For more about Valeria Vescina and her new book That Summer in Puglia click here.